"How You Can Use HOLOGRAPHIC CREATION to Easily Manifest Your Desires, even if you lack Visualizing Skills." Creating Reality Holographically is BEYOND VISUALIZATION! "I must say, your book has been the catalyst for helping me over the practical hurdle of actually taking manifesting as a disciplined part of life. The way you present the material makes it very doable and easy to understand. Thanks for taking the time to write such a helpful guide for manifesting. Hope and Enthusiasm back into your life! Confidence that your personal creations are growing. The freedom to live the life you've always wanted. A new self-image that expands your goals and dreams. Increased energy and zest for living. The practical methods to create what you want! A Step by Step Holographic Creation Sheet to increase your discipline and focus. Wouldn't it be amazing to MANIFEST what you want and take part in the GREAT AWAKENING that is occurring on this earth right now? If you are ready to purchase I Create Reality - Beyond Visualization, you can do so here, or read more below. You probably know of the increases in awareness and consciousness on the planet. Just think what it could mean for your life to find out about the reality of the unseen world, and how it responds to the holographic images you create with your mind! Choose to take part in rejuvenating the entire planet while also Creating What You Want! I am glad I got a chance to read your material, it may have changed my life. I just wanted to say that the I create reality Reality program is truly worth the small amount of money it costs...I have tried other programs in the past, and was greatly disappointed. One fantastic difference is the Holocreation sheet, it actually gives you a step by step way to create your own holograms, and to provide that secret added ingredient called "emotion" in just the right way, to literally manifest your dreams in front of your eyes. The holocreation worksheet enabled me to get clear on an image, feeling, details, etc, and literally was able to manifest something I had been "affirming " for months..(a love relationship, believe it or not)...I can honestly say for the money this is a fantastic manifestation program that I would recommend to anyone, just try it!!" You will Actually Learn how to Create Baby Holograms of your desires out of light and sound. These are real entities. Then you learn how to send these Baby Holograms into the soil of the Universe. They will grow into Full-Size Holograms that you will meet in Physical Existence. "I really appreciate the time you've taken to respond to my email. Thanks. I managed to download the book without any problems and I think it's brilliant. I'm starting my first creating this afternoon. I ... was sitting in front of the computer and this otherworldy energy came over me and somehow I found your site amidst a page of entries relating to affirmations. I found myself clicking on to your site and before you know it the material was in my hands, I think the universe was talking to me quite directly at that time. You can benefit from one of the most remarkable experiences I've ever had! I can't even take full credit for this book on Holographic Creation (I call the method HoloCreation). After twenty years of studying, reading, and application, these Principles of Reality Creation and Visualization with Emotion finally crystallized in an inspirational burst over the course of two days. If you want to create your own reality and live your dreams, this might be the most important book you'll have the chance to read! There are People who make things happen. And there are People who watch things happen. And then there are People who wonder what happened! Make positive things happen for you today! Life favors those who are bold, and who take positive action. This book is for you who believe that the Universe has a purpose, and that YOU have a purpose, and want to Achieve and Manifest your purpose in life. We All Create our Reality, but only a few want to admit it! This Book Shows You How to Identify what you really want, so you can create what you want, instead of what you may have been creating year after year. 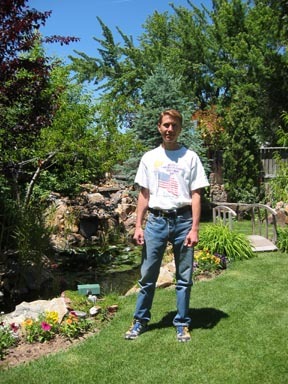 Through his counseling and consulting work, Christopher Westra has helped tens of thousands of people to clarify what they really want through detailed HoloCreation Techniques. Christopher has been studying visualization science, mental rehearsal, psychology, personal potential, and creative living for over 30 years.To see how well he knows what you want, think of ten things you currently are desiring. Go ahead and write them down on a scrap of paper. When you scroll down the page, you will be able to compare your items to a list of common desires. Either this is a universe with a purpose, or this is a universe without a purpose. This book is for those who know the universe has a purpose. The purpose of life, in the simplest way to put it, is to learn to control energy. Learning to control your mental energy comes from using your thoughts and emotions to create the physical reality you desire. You then live successfully with the matter and events in your world. By learning to guide and focus your thoughts in this way, your inner development is reflected in your outer physical world. We all participate in creating the exterior world, and this is essential for our growth and lessons while in this dimension. The better our abilities at creating reality, the better we are able to learn, solve problems, create abundance, build joyful relationships, and help others. You need specifics about personal creation ...by someone who has experience. OK, you've written down the ten items you are wanting right now. Compare your ten items to the list below and see if your desires don't fall into these categories that Christopher has developed from years of helping people. Have Financial Abundance - Make Money and Spend and Save Money. Live Your Dream - Freedom to do what you want to do when you want to do it. Be Happy - Experience joy and peace of mind. Save Time - Enjoy more real time for living. Develop Talent or Skill - Feel competent in the many areas of your life. Obtain Increased Health - Have more energy, less pain, more vitality. Have Comfort and Leisure and Recreation - Avoid overwork and frenzied lifestyle. Live in a Clean, Beautiful Environment - Have a neat, ordered living space. Be Honored and Respected - Gain praise, popularity and admiration. Gain Control Over Your Life - Be the captain of your ship, guide your life. Feel Good About Yourself - Know who you really are, confident in abilities. Develop Your Full Potential - Grow in knowledge and ability. Enjoy Loving Relationships - Sexual satisfaction, close family and friends. Create Beauty - Be involved in art, crafts, dance, hobbies, etc. Have Hope in the Future - Have a full expectation of desirable things to come. There you go - That's what people want. Did I hit them all? HoloCreation can help you create what you want in all these areas, and any others you have that I didn't include here! 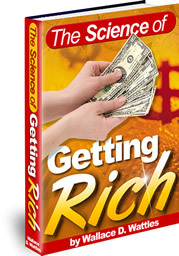 Free Bonus Book - The Science of Getting Rich. This book truly changed my life by breaking through my limiting beliefs. Yes, you get this book absolutely free with the purchase of I Create Reality - a downloadable version of this incredible success classic. Why accessing the emotions behind your desires can identify what you really want. (Chapter 8). Hint – What you really want may be very different than what you say you want. The two amazing benefits you will receive by asking yourself one simple question about each item you desire. (Chapter 3). The question is only three words long. Below is a brief list of benefits you get from the world's only Holographic Creation Consultant. Get into the thankfulness mindset. Move from vague desires to detailed images. Pick the right emotion to "launch" your desires into the universe. Recognize which action items are the most important. Identify limiting beliefs blocking what you want. Understand the philosophical assumptions of holographic creation. Know how your holograms are real. Be properly grateful to invoke the law of equal and opposite flow. Welcome what you want without grasping or craving. Be relaxed in body and mind to create the proper energy. Keep balanced in your image creation in all life areas. See your real desires underlying what you say you want. Learn more about your visualization style and how to use it well. Use your Daily Sheet as a journaling tool. Know how to "get into" the emotion while visualizing. Clear emotional blockages through double page scripting. Identify what you really want in life. See exactly what action items will move you forward. Use Extreme HoloCreation to destroy limitations. The Increased Consciousness Movement is growing in an incredibly rapid way. Millions of people are learning to focus their energy and thoughts, thus achieving more in life than they ever thought possible. There are more opportunities than ever before in history to use your resources to create worldwide as well as personal improvement. Discover the benefits that others are experiencing. As more and more people join forces to shape their environment, we can begin to alter much more than personal reality. We can change social reality! Decide to begin now. If you want to learn how to consistently gain the energy, focus, and vitality to achieve your dreams, then you need the information in this book! Why an Ebook? Discover the Benefits! 1 Save Money - No shipping, no taxes, and the lowest prices. 2 Control Viewing - Read online or print out a hardcopy. 3 Read Easily - Enlarge or reduce text size with a click. 4 Navigate Easily - Hyperlinked Table of Contents. 5 Search Effortlessly – Search capabilities with PDF format. 6 Purchase Easily – Use Credit Card, book is delivered digitally. 7 Access Instantly - You will be reading your book within minutes. 8 Choose Printing Options – Print a few pages at a time. 9 Save Paper – Print multiple pages on one sheet. 10 Be Guilt Free – No fossil fuels used for Ebook distribution. 11 Enjoy Variety - Able to change text and background colors. 12 Read Anywhere - computer, phone, tablet. 13 Store Easily - If you ever lose the book, just download again. You literally "can't lose". 14 Use Live Internet Links - When reading online. 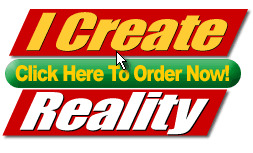 I Create Reality: "Beyond Visualization" How to Manifest Your Heart's Desires With Holographic Creation is (including bonuses below) in PDF format. If you have any trouble at all with the download process, I will make sure you get access to your book. My customers are my business! You can check out my customer service site here. We are all seeking for the same things. We all want increased life. We are all striving for the same goals (health, happiness, wealth, freedom, achievement, love, purpose). I tell you sincerely that HoloCreation has helped me clarify what I want, and get what I want. Following the HoloCreation Steps every day will bring incredible results in your life! The visual images you "launch" with the proper energy, emotion, and expectation will materialize into physical existence! This book tells you exactly how to do this. One: Describes the holographic domain of pure thought-energy, where images are just as real as "reality". Two: Shows you how to use visual images to clear emotional blockages! Three: Teaches that images (holograms) are literally made of matter (just more subtle matter or incipient matter). Four: Explains why it is essential to expand your visual images to ridiculous levels in order to expand your possibilities. This is the process of Extreme HoloCreation. Five: Tells you exactly how to convert your vague desires into concrete detailed images, even for those who have a hard time focusing! Six: Gives you specific ways to 'launch' your images with emotional energy. Seven: Shows you exactly how to relax and let the universe do its work! Eight: Offers you ways to think differently from the crowd to achieve different results from the crowd. Wanting a more abundant life is perfectly normal. In fact, an abundance is essential for fulfilling your purpose in life. You wouldn't be reading this unless you want more from life than you currently have. HoloCreation is the most important skill you can learn. We have been given this creation ability by the Creator, and most people don't even know how to use it. Your Success is Worth it! Never underestimate the power of one small action outside your comfort zone. I Create Reality:"Beyond Visualization" How to Manifest Your Heart's Desires With Holographic Creation along with some extra bonuses for acting now. Order now and receive the following free bonuses. I know that Holographic Creation has helped me create what I want in life. I want to include these bonuses to give you every possible reason to say YES to this offer today! Special Short Term Bonus below. 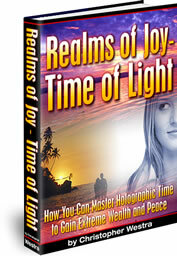 Special Temporary Bonus - Free Book on Holographic Time: This is my latest book titled Realms of Joy - Time of Light: How You Can Master Holographic Time for Extreme Wealth and Peace.This book is about how to transform your life by living in holographic time rather than linear time. Sales have been great and I'm feeling generous. This book won't be available for free from this site for very long. So act fast and order now if you want it free! You won't find a book like this anywhere else but right here. Consciousness and time have been studies of mine for many years. FREE BONUS #1- The Science of Getting Rich: You will also be given the book that started me on creating my own reality and following my purpose. I spend 30 minutes a day with this book! The book is called The Science of Getting Rich. This book teaches the step by step system that Mr. Wattles says will not fail! It does tell you how to get rich, but it tells you so much more than that also. The teachings sent shivers up my spine the first time I read it. This is the original book with all of Dr. Wattle's famous teachings about transforming your life! 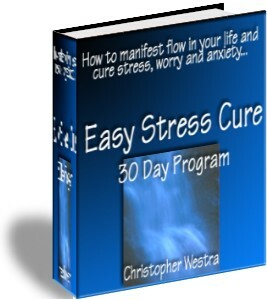 FREE BONUS #2- Easy Stress Cure: The next 50 Customers to order will also receive my book on the Easy Stress Cure 30 Day Program - This book is subtitled "How to Manifest Flow in Your Life and Cure Stress, Worry, and Anxiety". A great companion to I Create Reality, Easy Stress Cure tells you how to stop resisting your life and go with the flow for greater success, peace, and happiness. FREE Bonus #3 The Shocking Truth about Action: This power packed 9 page PDF booklet by Robert Anthony shows you why most people try to manifest in reverse! We put way too much emphasis on action on not enough emphasis on thought. This book is a super supplement for creating your reality and goes hand in hand with Holographic Creation. Being, not doing, is the first and most important step in the creative process. Read much more in this incredible book! FREE Bonus #4- 15 Minute Phone Consultation: For a limited time, every customer will receive a Free 15 Minute Consultation ($50 Value) with Christopher. You will receive personal training and answers to your questions about Holographic Time and Holographic Creation. Note - I don't know how long I will be able to keep up with these personal consultations, so act now! Special Audio Offer - "I Create Reality - Beyond Visualization" has been recorded as an audio program. If you would like to purchase all the ebooks and bonuses above, and the audio download for $35, then use this order button below. The HoloCreation Method is unique and not available anywhere else. Your satisfaction is absolutely assured through my no risk, 100%, no-questions-asked, money-back guarantee. If for any reason, you aren't completely satisfied, just contact me within 60 days and I'll refund 100% of your purchase price! Try it out for two full months - risk free. Your transaction is secure and safe, and the download process is simple. Try it today, even if this is your first Ebook. If you need help downloading, just email me or call me after purchase and I will help! About every tenth customer needs help downloading because it's new for them - That's OK! If this book doesn't give you solid, practical information to increase success in every area of your life, then you get all your money back! You have nothing to lose (and an awesome new life to gain), so order now. It's easy to download your Ebooks! Once your credit card is approved, you will be taken to a special Thank You page where you will download all the books and bonuses. It doesn't matter if it's the middle of the night! You will be downloading and reading this information within just a few minutes... and using it to create the reality you deserve! P.S. - I Create Reality:"Beyond Visualization" How to Manifest Your Heart's Desires With Holographic Creation will be priced at $49. I can't guarantee how long the introductory price of $28.19 will last, so act now! P.P.S. -- Make the decision: If you don't purchase this book, where will you be weeks from now? Probably right where you are now. Positive change comes from new ideas. Get the success you want through the motivation and specific instruction provided in this book. Wouldn't you like to have increased energy, more focus for goals and dreams, and a new ability to create what you really want? To make your life different, you must start to do things differently. Start today.